The customer (previous owner of the property) wanted a shed, but not just any shed. It was to blend with the surrounding landscape and also be big enough to use for storage and stabling horses. We met with the client to find out what he needed the space for. 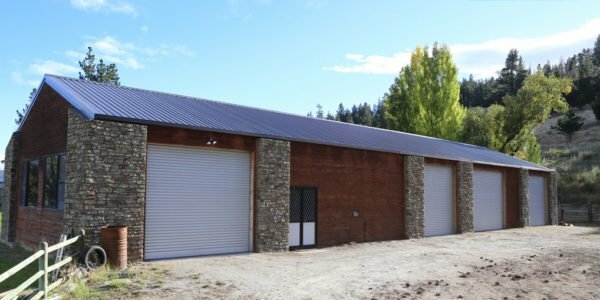 He specified that he needed shelter for horses, feed storage, a workspace and garage. It was to be a good looking building with a schist front. We designed and engineered the structure for the site. Framing was cold rolled steel, providing durability. Standard internal walls divided the building into a garage, office/workshop and stable areas. Extra overhang was included right round the building to protect the schist and cedar cladding. We supplied the customised kitset. The shed was erected by the client, a builder. A good looking structure that is also practical, strong and durable. Retired farmers, Pete and Carol Roberts bought this property (with the custom shed) in 2008. They have fitted roller doors to the open bays (ex-stables) and added a hoist to create a workshop for Pete’s collection of classic cars, motorbikes and tractors.